Astronomers have discovered a speedy spinning pulsar in an elongated orbit around an apparent Sun-like star, a combination never seen before, and one that has them puzzled about how the strange system developed. 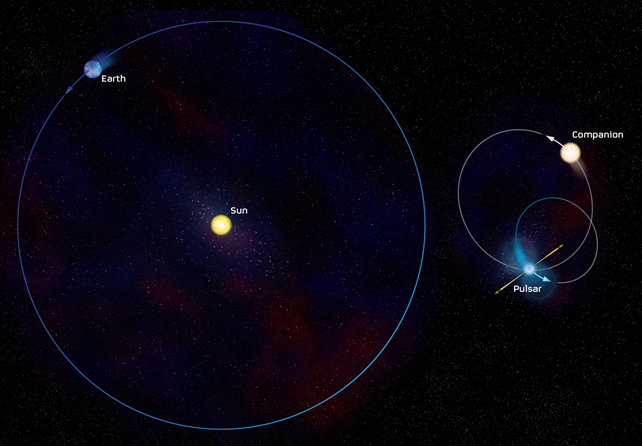 Comparing Orbits of Pulsar and Its Companion to our Solar System. Click on image for full caption information and available graphics. "Our ideas about how the fastest-spinning pulsars are produced do not predict either the kind of orbit or the type of companion star this one has," said David Champion of the Australia Telescope National Facility. "We have to come up with some new scenarios to explain this weird pair," he added. Astronomers first detected the pulsar, called J1903+0327, as part of a long-term survey using the National Science Foundation's Arecibo radio telescope in Puerto Rico. They made the discovery in 2006 doing data analysis at McGill University, where Champion worked at the time. They followed up the discovery with detailed studies using the Arecibo telescope, the NSF's Robert C. Byrd Green Bank Telescope (GBT) in West Virginia, the Westerbork radio telescope in the Netherlands, and the Gemini North optical telescope in Hawaii. The pulsar, a city-sized superdense stellar corpse left over after a massive star exploded as a supernova, is spinning on its axis 465 times every second. Nearly 21,000 light-years from Earth, it is in a highly-elongated orbit that takes it around its companion star once every 95 days. An infrared image made with the Gemini North telescope in Hawaii shows a Sun-like star at the pulsar's position. If this is an orbital companion to the pulsar, it is unlike any companions of other rapidly rotating pulsars. The pulsar, a neutron star, also is unusually massive for its type. "This combination of properties is unprecedented. Not only does it require us to figure out how this system was produced, but the large mass may help us understand how matter behaves at extremely high densities," said Scott Ransom of the National Radio Astronomy Observatory. Pulsars are neutron stars whose strong magnetic fields channel lighthouse-like beams of light and radio waves that whirl around as the star spins. Typical pulsars spin a few times a second, but some, like PSR J1903+0327, are much faster, rotating hundreds of times a second. They are called millisecond pulsars. Astronomers think most millisecond pulsars are sped up by material falling onto them from a companion star. This requires the pulsar to be in a tight orbit around its companion that becomes more and more circular with time. The orbits of some millisecond pulsars are the most perfect circles in the Universe, so the elongated orbit of the new pulsar is a mystery. "What we have found is a millisecond pulsar that is in the wrong kind of orbit around what appears to be the wrong kind of star," Champion said. "Now we have to figure out how this strange system was produced." The scientists are considering three possibilities. The first, that the pulsar simply was born spinning quickly, seems unlikely to them. Another possibility, they say, is that the pulsar was formed in a tight group of stars known as a globular cluster, where it had a companion that spun it up. Later, a close encounter with another star in the cluster stripped it of its companion and flung it out of the cluster. For several reasons, including the fact that they don't see a nearby cluster from which it could have come, they don't like that explanation either. A third scenario says the pulsar may be part of a triple, not a double, star system. In this case, the pulsar's 95-day orbit is around a neutron star or white dwarf, not the Sun-like star seen in the infrared image. The Sun-like star would then be in a more-distant orbit around the pulsar and its close companion. "We've found about 50 pulsars in binary systems. We may now have found our first pulsar in a stellar triple system," Ransom said. The international research team is busy trying to get their answers. They will study the star in the infrared image further to confirm the indications that it is similar to our Sun and that it actually is a companion to the pulsar. Additional radio observations will study the pulsar's orbit and seek to measure its motion in space. "This is a fascinating object that has a lot to teach us about physics. It's going to be exciting to peel away the mystery of how this thing came to be," Champion said. Meanwhile the survey with Arecibo goes on. Other, more conventional millisecond pulsars have been found, but it is almost certain that there will be more surprises, said Jim Cordes of Cornell University, chair of the consortium that is doing the survey. The large volume of data for the survey is archived at the Cornell Center for Advanced Computing, and is then processed using computer clusters at several consortium-member sites around the world. The National Astronomy and Ionosphere Center is operated by Cornell University under a cooperative agreement with the National Science Foundation.